I'll never let her sleep in our bed. I'll never eat dinner at 5 pm. I'll never bribe my boy to use the potty. Parents-to-be all have a list of "never-do"s, which gets shorter with every few weeks with their children. My never-do? My family will never wear matching clothes. Family photos with perfectly coordinated outfits always call to mind Lucille and Buster Bluth. Doing my never-do started innocently enough. When D was 7 weeks old, his dad and I realized we didn't have a good photo of the three of us. The two of them were coincidentally in navy blue, so when I changed out of my second spit-up stained shirt of the day, I opted for teal. We had recently borrowed a baby hat with blue and teal stripes that looked so cute next to our own clothes...that wasn't too matchy-matchy, was it? The photos were indeed adorable, but they started us on a slippery slope to my never-do. D and his dad now have an impressive collection of matching polo shirts, sweaters, and even socks. But I'm taking things a step further this month while preparing to attend a family wedding. This plan started innocently enough, too. I just bought my first dress truly worthy of tailoring. After cutting the length down to size, there was plenty of extra fabric. Wouldn't it look cute as a bow tie? I started with this helpful and quick tutorial from Make it & Love it. The size of my dress scraps didn't quite meet the required amounts, but that's when I learned that bow ties can come in all shapes and sizes. 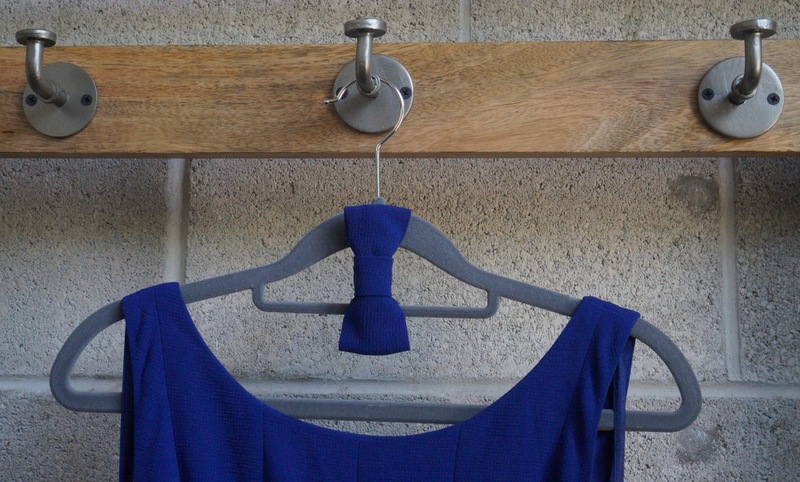 A bow tie is the perfect scrap project: make yours skinnier or thicker depending on your style and whatever kind of fabric you've got, and don't worry about matching the thread color because nothing will be visible. The other change I made to the pattern was to use a metal bow tie clip instead of a fabric closure, because D prefers clip ons (and by "prefer," I mean "will keep on for at least 10 minutes"). You can see where this is going. With 9 more bow tie clips here at home, and an easy, infinitely variable pattern, D and I are probably going to have more coordinating outfits. Just stop me before I take us to Motherboy. How do you fly with a toddler?